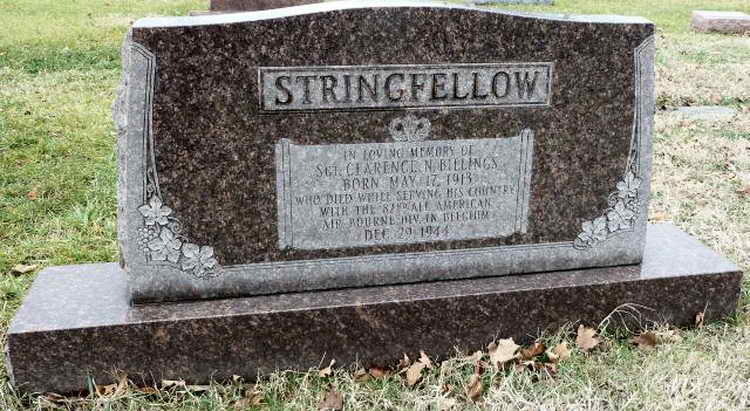 Grave marker for Sgt Clarence N. Billings in Section F of the Willow View Cemetery, Dayton (Montgomery county), Ohio. Clarence enlisted in the Army at Ft Benjamin Harrison, IN in October 1942. He arrived at Camp Blanding, FL on 30 Oct 1942 and was assigned to Company D. He was transferred to Hq 2nd in May 1943. Sgt. Billings was slightly wounded in action on 17 Sep 1944 and rejoined the unit on 27 October 1944. Sgt Billings took part in the Battle of the Bulge when the regiment was moved forward on 18 December 1944. Unfortunately, he was killed in action on 29 December 1944. His military awards include the Purple Heart wit one Oak Leaf Cluster.